Numerous quakes around the ring of fire today. The earthquake, which struck at 7:18 a.m. local time on Saturday, was centered about 32 kilometers (19 miles) southeast of the island of Agrihan, or 364 kilometers (226 miles) north of Saipan, which is the largest island of the Northern Mariana Islands. The Pacific Tsunami Warning Center measured the preliminary magnitude of the earthquake at 7.7 but said it struck at a depth of 203 kilometers (126 miles), which will significantly minimize its effects. The earthquake was widely felt in both the Northern Mariana Islands as well as the U.S. territory of Guam. "Based on all available data, there is no tsunami threat because the earthquake is located too deep inside the Earth," the tsunami warning center said in a bulletin. Chile's Hydrographical and Oceanographical Service of the Navy (SHOA) briefly issued a tsunami warning but canceled it just minutes later. At least 73 are dead and 150 people are missing after a powerful earthquake rocked Italy overnight. The 6.2-magnitude quake at around 3.30am local time was so powerful it was felt more than 100 miles away in the centre of Rome. Survivors today described 'apocalyptic' scenes in towns and villages near the city of Perugia - the capital of the tourist-packed Umbrian region, which is especially popular with British holidaymakers. 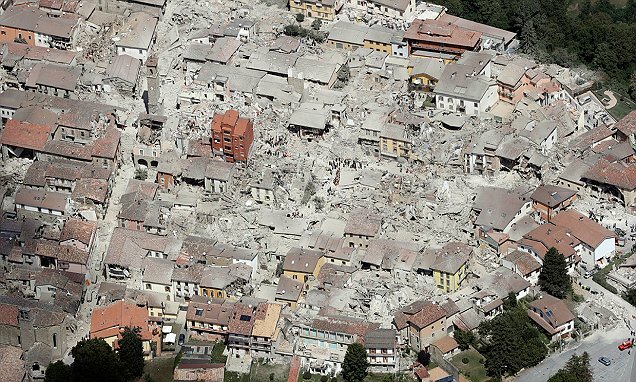 The quake has devastated the mountainside towns and villages of Amatrice (pictured left and right), Accumoli, Arquata del Tronto and Pescara del Tronto. The mayor of Amatrice, Stefano Petrucci, said this morning: 'My town isn't here anymore' as people were carried out of ruined buildings on stretchers (right) and locals desperately searched the debris for survivors or sobbed as they inspected their own ruined homes. An earthquake with a preliminary magnitude of 7.2 struck off the New Zealand coast, the U.S. Geological Survey said Thursday. The temblor, which struck about 4:37 p.m. UTC , was centered approximately 104 miles northeast of Gisborne and 145 miles east of Tauranga, according to the incident page. It was downgraded a short time later to a magnitude-7.1 quake. The undersea quake triggered a “very small” tsunami that hit the country’s northern coast, USGS geophysicist John Bellini said. There were no immediate reports of any injuries or serious damage. The Pacific Tsunami Warning Center has not issued a Pacific-wide warning for the potentially destructive ocean waves. The Gisborne District Council has urged people along the coast to evacuate the area and head to higher ground. Local residents reported on Twitter that the shaking lasted anywhere between 30 seconds to at least a minute long. 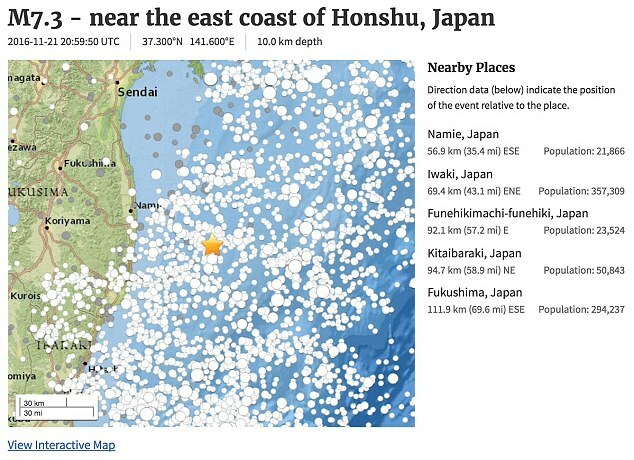 “That was the longest earthquake I’ve ever been in,” a user named Jo Honey tweeted. It was powerful enough to wake up residents in Auckland, hundreds of kilometers west of the epicenter, Auckland-based journalist Aroha Hathaway said. A short time after the large quake, Hawaii’s Emergency Management Agency tweeted that there was no tsunami threat to the state. The area where the temblor hit — the eastern margin of the Australia plate — is among the most seismically active on the planet, according to USGS. Fifteen earthquakes with magnitudes of at least 7.5 have been recorded near New Zealand since 1900. A powerful earthquake has struck New Zealand near the city of Christchurch, with strong jolts felt over 200 kilometers (120 miles) away in the capital, Wellington. There were no immediate reports of major damage or injuries. There was no immediate danger of a tsunami, according to the Pacific Tsunami Warning Center. The magnitude-7.4 quake struck just after midnight Sunday and was centered 93 kilometers (57 miles) northeast of Christchurch, according to the U.S. Geological Survey. It was at a relatively shallow depth of 10 kilometers (6 miles). Earthquakes tend to be more strongly felt on the surface when they're shallow. 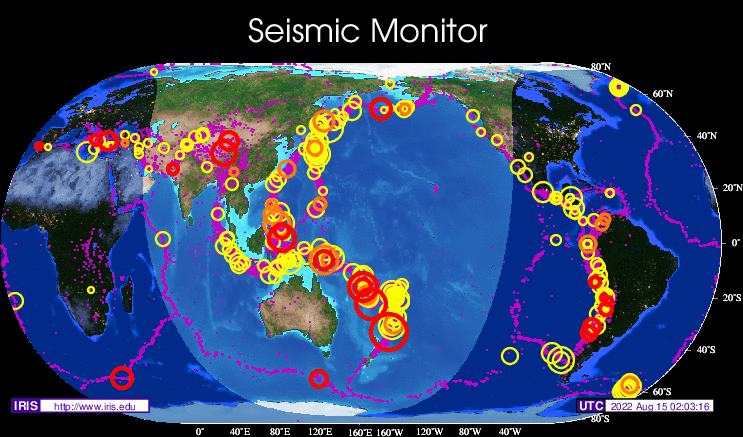 New Zealand sits on the "Ring of Fire," an arc of seismic faults around the Pacific Ocean where earthquakes are common. An earthquake in 2011 in Christchurch killed 185 people. New Zealand authorities have issued a tsunami warning, urging people along the entire east coast to move inland or to high ground, after a powerful earthquake hit northeast of Christchurch, the biggest city on South Island. The tremor, with a magnitude initially estimated at 7.4 before being scaled up to 7.8, had a shallow depth of 23km, according to the US Geological Survey. It was centered 46km from the town of Amberley with about 2,000 people, 70km from the town of Kaiapoi with 10,000 residents and 91km north-northeast of Christchurch. An earthquake of magnitude 7.3 struck early on Tuesday, local time, off the Japanese coast, some 67 km northeast of Iwaki, the U.S. Geological Survey said. The USGS reported the quake with a depth of 10 km struck about 6am and tsunami waves up to one metre high began to hit Japan's Pacific coast in numerous areas about 7am. Initial waves were between 30-90cm in high but larger waves were expected to hit. It was estimated Tsunami waves would reach three metres tall in areas on Tuesday. The epicentre of the quake was near Fukushima, where in 2011 an earthquake caused a nuclear plant meltdown. Earthquake, tsunamis... and even a METEORITE! Dramatic footage shows a flaming object trailing across the evening sky (right) while Japan was still assessing the damage from the 7.4-magnitude tremor. Alarms rang out in towns across Fukushima prefecture - where the 2011 earthquake wreaked havoc - and further along Japan's eastern coastline. Around an hour later, a tsunami flowed inland and up the Suna'oshi River in Tagajo (left) - a city devastated in the 2011 earthquake - almost bursting its banks. 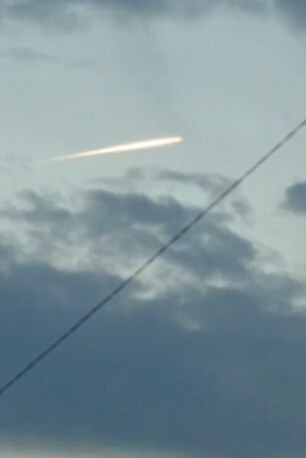 Video taken by a 16-year-old known as Asuka then showed a mysterious burning light crossing the night sky. 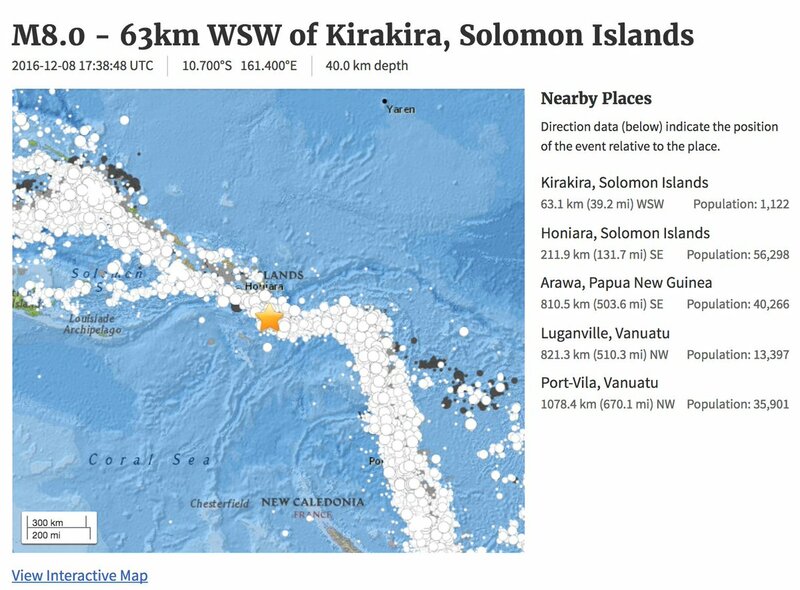 There are a number of 7. quakes around the ring of fire and elsewhere. Is this because of the SOLAR WIND STORM: Earth is now fully inside a high-speed solar wind stream flowing from a large hole in the sun's atmosphere. Gusts clocking 600+ km/s are causing G1-class geomagnetic storms and bright auroras around the poles. Perhaps something else? DEVELOPING – An earthquake of magnitude 6.5 was reported 102 miles west of Ferndale off Northern California on Thursday, the U.S. Geological Survey announced. JUST IN: Tsunami watch issued for Hawaii following 8.0-magnitude earthquake in Solomon Islands. JAKARTA: An earthquake measuring 6.6 on the Richter scale jolted Indonesia on Wednesday, officials said. 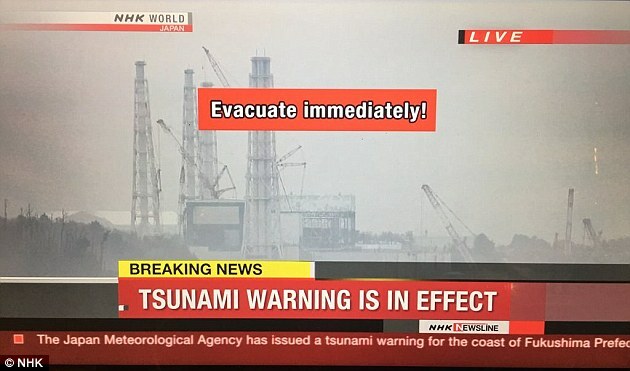 No tsunami alert was, however, issued. A 5.8-magnitude earthquake followed by more than 20 aftershocks rattled Ecuador's Pacific coast before dawn Monday, causing two deaths and heavy damage to hotels and homes in resort towns, officials said. SANTIAGO, Dec 25 (Reuters) - Officials removed a tsunami warning after a magnitude 7.6 earthquake struck 225 km (140 miles) southwest of Puerto Montt in southern Chile on Sunday, prompting an evacuation order for southern coastal areas. The U.S.-based Pacific Tsunami Warning Center said the tsunami warning was no longer in place for the area after earlier issuing one for areas within 1,000 km (621 miles) of the epicenter of the quake. Chile’s National Emergency Services (Onemi) chief Ricardo Toro said a tsunami watch remained in place, and reiterated his call for Los Lagos residents to abandon beaches and go to higher ground. Toro said no fatalities had been reported. Onemi said approximately 4,000 people had evacuated the Los Lagos area. The quake’s depth was about 34.6 km (21.5 miles), the U.S. Geological Survey said. According to media reports, the quake was felt in the southwest Argentine city of Bariloche. Chile is the world’s leading copper producer, but there are no major mines located near the zone affected by the earthquake. Chile’s state-run oil company ENAP said its Bio Bio refinery in southern Chile was operating normally. Chile has a long history of deadly quakes, including a 8.8 magnitude quake in 2010 off the south-central coast, which also triggered a tsunami that devastated coastal town. Lot's of shaking this past month. Something is going on at the core of the earth. We are entering a 9 day cycle as a massive coronal hole in the Sun is now Earth facing. We are seeing massive amount of radiation hitting Earth from satellite detection equipment. The strongest solar winds will be on Jan 4th and 5th and could trigger quakes during that time. If you live near a fault zone it's a good idea to have at least a few days of emergency suppliers on hand if utilities are knocked out during a big quake.